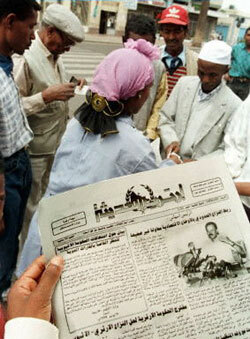 At the newsstand in Asmara, Eritrea (Photo: AFP). It was Sept. 18, 2001. The world was still reeling from the unprecedented terrorist attacks on the United States only seven days earlier. And so practically no one noticed when Eritrea’s autocratic and often-erratic president, Isaias Afwerki, completely shut down the small, Red Sea nation’s privately owned press. Today, in this country of fewer than 4 million people, more journalists are held in prison, often incommunicado and without charge, than in any other African country. The crackdown on Eritrea’s independent press had been brewing throughout the summer of 2001. In May, 15 senior members of the Eritrea’s ruling party, the People’s Front for Democracy and Justice (PFDJ), wrote an open letter to all party members criticizing Afwerki—who had suspended Eritrea’s National Assembly and ruled without holding an election since the country won its independence from Ethiopia following 30 years of ruinous war—for acting in an “undemocratic and unconstitutional” manner. The independent press naturally seized upon the story, publishing interviews with the disaffected PFDJ members and penning sympathetic editorials. That day, seven former ministers and generals who had signed the open letter were arrested. Over the following days, at least 10 Eritrean journalists were imprisoned. In following months, three more were jailed. In July 2002, the New York-based Committee to Protect Journalists confirmed that a fourth had been arrested trying to cross the border into Sudan. Milkias Mihretab, who is the recipient of this year’s Percy Qoboza Award of the U.S.-based National Association of Black Journalists, which recognizes an extraordinary work of journalism under tremendous obstacles, and Amnesty International’s 2002 Special Award for Human-Rights Journalism Under Threat, was an editor of Keste Demena, an independent weekly paper closed down on Sept. 19. Mihreteab: Eritrea’s press laws have a lot of vague and controversial articles that the independent press had a hard time following. The press law proclamation of 1996, commonly called Proclamation 90/98, has many rules, regulations, and penalties that are difficult to understand. It is full of nationalist [rhetoric], and tends to view those who do not abide by this as unpatriotic. For example, an article in the press law states that a journalist should not disseminate news that destabilizes the nation. The term “destabilize” is subject to different interpretations. A paper may run a story about corruption in the army. That would automatically be interpreted as “destabilizing news” putting the journalist in peril. There were instances in which reports of a certain administrator’s mismanagement were interpreted as “destabilizing news” and the journalists were penalized. The press law’s definition of defamation makes it very difficult to criticize an official or an institution. A journalist cannot question the educational background or capacity of certain officials, because that could be deemed as dishonoring the official. So the press law was actually very discouraging and hindering to the profession of journalism. What issues did the Eritrean government not want the independent press to cover? We challenged the government, the unconstitutional way it operated, and the special courts [which try suspects behind closed doors, with no right to a defense council and no right of appeal]. The independent press severely criticized the government on the disastrous war with Ethiopia and the regime’s ineptness. We also entertained public opinion, which was mostly pro-reform and anti-dictatorship. You currently have more than 10 criminal charges pending because of your writings. Without exaggeration, the life of an independent journalist in Eritrea was hell! Almost all the papers censored themselves system just to survive. Because even the slightest comment might be interpreted as enemy propaganda or anti-Eritrean. If we run some bold articles, we sometimes have to hide, go to the countryside, just to avoid immediate wrath or arrest. Besides all this, we had technical problems: shortage of equipment, small readership, distribution problems, and high printing costs. Usually what happens is the security people will pick you either from the street, your home, or office. They take you to one of the many detention centers in the capital city, and then either you will be released after heavy international pressure, or you will rot there… as is the case with many Eritreans. On Oct. 14, 2000, the police picked me up along with seven other journalists. After heavy pressure and criticism from some western countries, the authorities released six of us, leaving Yusuf Mohammed Ali [editor of Tsigenay. Ali is currently in prison] and me behind. The prison condition was bad. It was crowded and dirty, family contact was extremely limited. The Zara concentration camp, where I spent almost six months, is the worst. Beating was normal. Some died because of disease and malnutrition. On March 31, the Eritrean journalists left in jail began a hunger strike, claiming they were held illegally. In a letter smuggled out of the prison, the hunger strikers said they were seeking "justice before a fair and independent court." Following that, the detainees were moved to a new location, which the government refused to disclose. What is your reaction to the government actions in regard to those detained journalists? As the government of President Isaias Afewerki becomes more and more lunatic, it may take desperate actions. No one can tell for sure what will happen. [The detained journalists’] lives are in danger; unless there is a strong pressure from the international community… in today’s Eritrea, anything can happen.